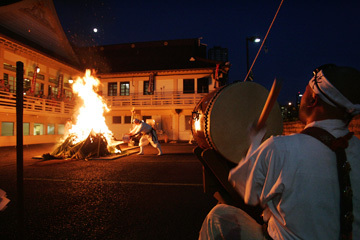 Shingon Buddhist monks from Japan performed a fire ritual yesterday at the Shingon Shu Temple on Sheridan Street, celebrating the temple's 90th anniversary. 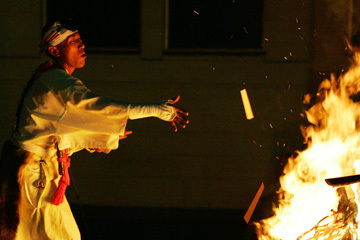 It was only the second time such a ritual had been performed in Hawaii. The full moon was rising above the temple. 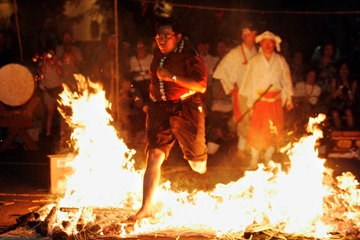 Temple director Reyn Tsuru ran across burning coals. To open the ceremony, monks entered the temple and blew conch shells in front of the altar. 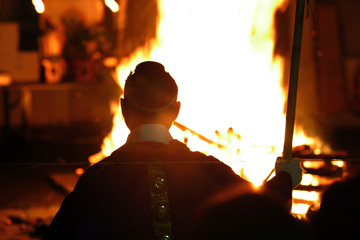 One of the visiting monks threw prayer tablets onto the flames.